Breathe cleaner air, as you neutralize contaminants and reduce stress. Create a soothing environment for those you love; from baby nurseries to computer work stations–purify indoor air with nature’s natural ionizer. This traditional Himalayan salt lamp is handcrafted from salt crystals found in the foothills of the Himalayas, and is capable of generating natural negative ions. As the salt crystals are warmed by the bulb, they release charged ions, neutralizing contaminants in the air. These easy-to-use lamps plug into any USB port (regardless of computer platform) and the lamp begins to work immediately–creating a nurturing glow and drawing the negative energy that tends to accumulate in the space where computer work is done. For your convenience your Zennery Himalayan Salt Lamp can be used with any USB1 plug so can convert to a conventional plug in. 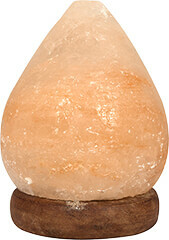 Zennery Himalayan Salt Natural Shaped USB Lamp is a wonderful addition to any home or work space. Remember, if your salt lamp starts to leak, that means it's doing its job! Himalayan Crystal Salt (and most salt) is hygroscopic, which means that it naturally attracts moisture. When the lamp is switched off and there is no heat source, the block of crystal salt attracts the moisture from the air to the surface of the lamp. If the lamp is moist you can put it out in the sun to dry for 4-5 hours and then bring it in and turn the lamp on. Excess salt can easily be brushed off. Oil of Oregano has been held in high regard for its holistic qualities. It contains a number of valuable constituents and includes naturally occurring antioxidant phytochemicals. ** Our high-quality softgels make it easy to obtain "traditional goodness from Mother Nature."